After a rushed visit to a konbini to grab breakfast, we began our day at Waseda University where we met Aridome-sensei’s former elementary school classmate, Ozaki-san. I chatted briefly with Ozaki-san as we walked towards Tsukiji Fish Market and immediately felt grateful to have such a warm and caring guide for the day. Tsukiji was massive and overwhelming. We shuffled in and out of rows of intermediate wholesalers selling everything from huge pieces of tuna to thousands of squirming sardines. As I thought back to Theodore Bestor’s piece entitled “Wholesale Sushi: Culture and Commodity in Tokyo’s Tsukiji Fish Market” that we had read in preparation for our visit, I tried to look for consistencies and inconsistencies at the marketplace itself. 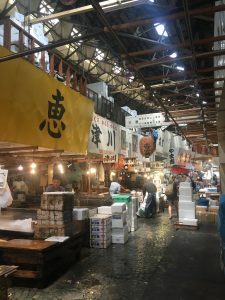 For example, Bestor discusses the perception of fish as fundamentally Japanese cuisine, such that the market not only serves as a place of transactions but also as “the stage upon which consumption is rehearsed and displayed.” The sheer fact that so many tourists—foreign and Japanese—gathered with cameras around the market was sufficient to demonstrate the extent to which this market and its fish provide a deep cultural experience, and are thus perceived as fundamentally Japanese. In contrast, however, I did not feel that the arrangement of the market or the attitude of its wholesalers were geared towards observers and consumers whatsoever. Very few English signs or labels were present relative to many other parts of Tokyo, and wholesalers barely acknowledged the existence of those walking through (besides yelling or honking their horns for them to move). 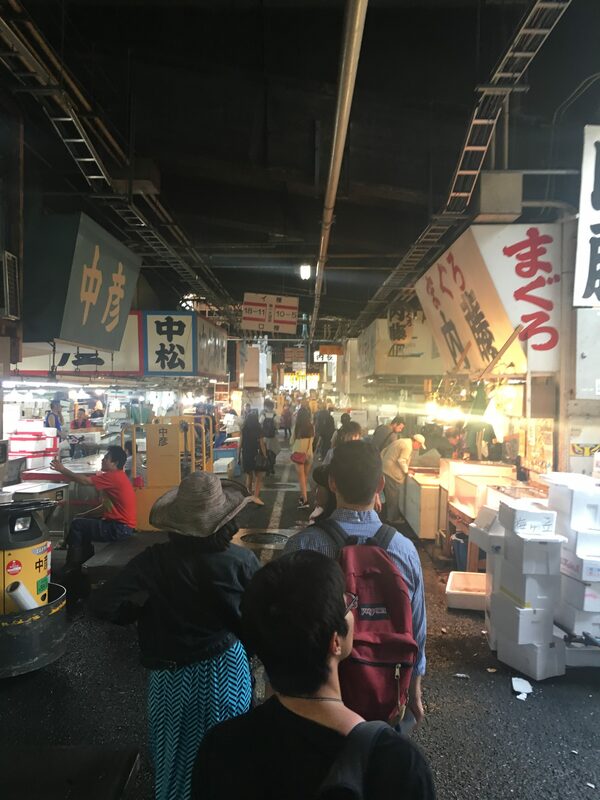 I wonder if Bestor’s idea that Tsukiji rehearses and displays consumption will shift to not just include the marketplace as one node in a chain that determines the prices, demand, and availability of fish, but also to include visual displays at the marketplace itself. 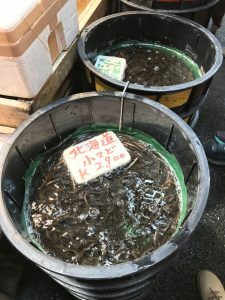 As Tsukiji prepares for relocation in the near future, it will be fascinating to see how these perceptions of fish as fundamentally Japanese and the boom in tourism intersect to create a new kind of marketplace. The thin red curtains cast a strangely pink glow as the sun’s rays peak over the city skyline and sneak their way into our apartment. It almost simulates a real sunrise, even though surely it’s been hours since the sun rose. It’s about 6:00 or 7:00 am, here in Shinjuku, Tokyo; a surprisingly normal wake up time considering jet lag. We started our day off with a コンビニ (conbini; convenience store) breakfast: I got a strawberry yogurt drink, egg sandwich, and musubi. Surprisingly tasty and filling for the price, time, and long day ahead of us. I don’t think I can even begin to capture all the information and details and everything that Oozaki-san (our tour guide for the day and Aridome-sensei’s good friend) left us with. So I’ll be focusing mainly on highlights and things that stood out to me. We met Aridome-sensei’s dear friend (親友; shinyuu), Oozaki-san, at Waseda University. Oozaki-san is a nationally certified tour guide, so we were definitely in for a treat today! After a 上手 (jouzu; skillful) 自己紹介 from Ethan (and shorter ones from the rest of us), we set off for Tsukiji Fish Market. 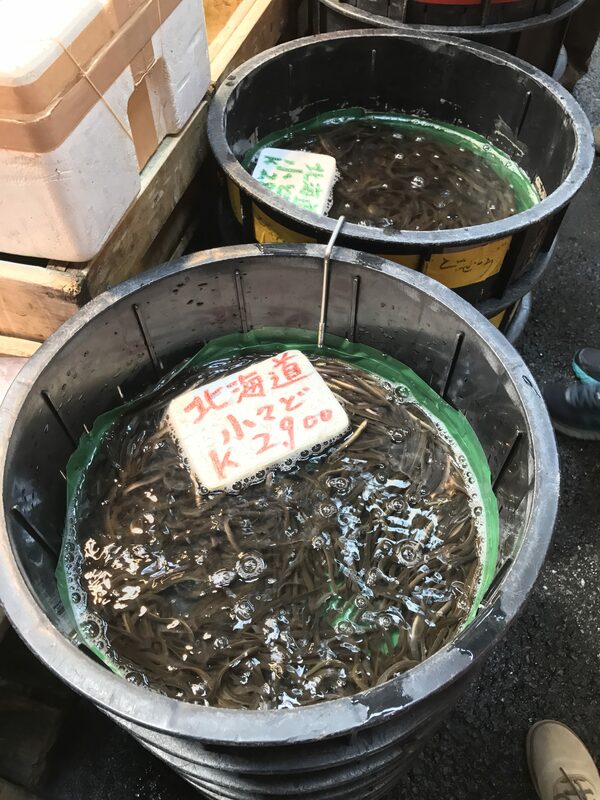 Selinger-sensei and Aridome-sensei both expressed concern that, given my fascination with marine life and vegetarianism, if I would be okay walking through the aisles of Tsukiji, where wholesalers prepare and package the fish they bought earlier (think 5:00 to 7:00 am) at the auction. It’s definitely an interesting question that I’ve been asked before and is perhaps relevant to my own project: If we are to value marine life so highly, especially Japan as an island nation, does that mean we forego consumption of marine life? Or, does consumption of it also convey that reverence? For me, I tend to approach vegetarianism from an environmental perspective; that is, I think the way meat is produced and processed (especially in the United States) is inefficient and leads to a whole host of environmental problems. Also, it’s hard to know exactly where your meat (or any food really) comes from and how it was handled. So processing of fish, like at Tsukiji, doesn’t really bother me. The way I see it, if it’s not the blades of a skilled wholesaler, it could very well be the blade-like teeth of, say, a shark or other predator a trophic level above that fish. More so the case, I was really interested in trying to identify various species as best as I could, to as specific a taxon as I could manage. I was also intrigued by the decisions to either present fish as live fish, whole (dead) fish, or in pieces. Walking through the aisles of Tsukiji Fish Market. A wholesaler at Tsukiji Fish Market. Sardine-looking fish at Tsukiji. An example of live fish displays. We also visited numerous shrines and got a really historical view of Tokyo. Apparently, a large portion of it, which encompasses Tsukiji, is reclaimed land. 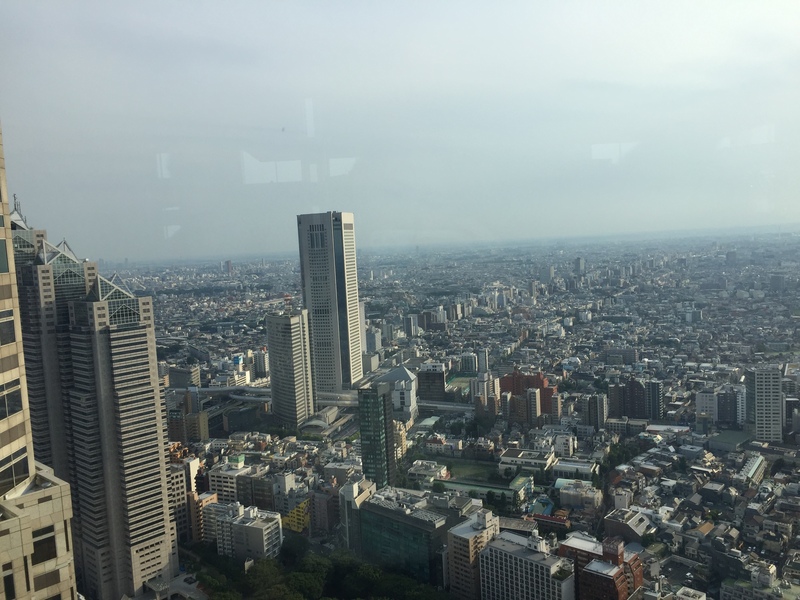 I was also very impressed with the Tokyo skyline, from two separate buildings (I’m blanking on one of them, apologies; the other was the Tokyo Metropolitan Building). 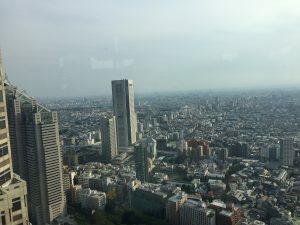 I’m usually not much of a city person (some friends from Boston like to joke that I’m from the “countryside”), so I had some mixed feelings about Tokyo. As I was telling Aridome-sensei, I think Tokyo feels more open and less suffocating than a city like New York, where skyscrapers obscure the view of the sky and everything feels grid-like. 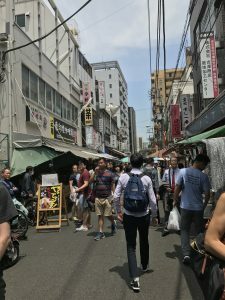 Maybe it just had to do with the district, but Shinjuku and Ueno had a different, lighter and more modern feel than New York. 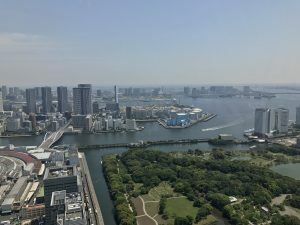 I also think Tokyo has more green spaces interspersed and the skywalks and monorails help you get off the ground and add a lot of layered complexity to the city. Speaking of transportation, I was impressed by the efficiency and sleekness of Tokyo’s subway system. Definitely rivals New York’s subways in terms of sprawl and Boston’s T in terms of organization and modernity (namely, the T’s blue line). Tokyo subways are a lot more crowded, though, and it kind of made me realize that, besides the lack of natural spaces and being surrounded by concrete/metal faces (which I already knew), cities bother me because of how congested they are. I like efficiency, so moving at a snail’s pace amidst a crowded street or subway and being pressured from behind to keep moving even though I physically can’t is somewhat frustrating for me, I think. Namiyoke Inari Shrine. “Namiyoke” apparently means “protection from waves,” which I think is really cool! A relatively crowded market street. We got daifuku mochi here. おいしかった! Stunning view of the Tokyo skyline. All of this is reclaimed land, and if you look to the left you can see a bit of Tsukiji. I was also struck by how difficult it can be to have dietary restrictions in a foreign country. We ate lunch at this wonderful restaurant on the second or third floor of an outdoor-ish mall. They had an English menu, thankfully, but even then they had relatively few vegetarian options. I ended up getting curry again (granted, it was すごくおいしかった = sugoku oishikatta = extremely tasty), but it came with a bunch of sides like miso soup, salad with a peanut and ginger dressing, etc. 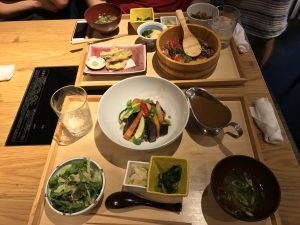 Later, when we were getting dinner after a long day (I was dragging at this point) at a デパ地下 (depachika; contraction of デパート and 地下; aka, department store basement), Oozaki-san showed me around to the various vegetarian (肉がない; niku ga nai; meatless) options. 本当に肉がないオプションをみせてくれてありがとうございました (hontou ni, niku ga nai option wo misetekurete arigatougozaimashita). I realized it’s really difficult simply browsing and trying to discern what options don’t have meat; I suppose a more active approach (i.e. asking which options are meatless) is probably more effective. Lunch consisting of curry rice and vegetables, salad with peanut ginger dressing, and miso soup. すごくおいしかったよ. Tsukiji now sits on some of Japan’s most expensive real estate (right next to Ginza). For economic purposes, Tsukiji will most likely be moved to a different place. With its stone streets gone, its grubby candor will be lost to a modern facility. As mentioned in the reading, the presentation of the goods were stunning. Display sections in the “separate” market were decorated accordingly and the fruit simply stunning. Vegetables and fruits were carefully examined, washed, packaged and each were exquisitely mouth-watering. After Tsukiji, we walked to different parts of Tokyo, like Shiodome and Ueno Park. From the top of one of the sky scraper, Tokyo’s reclaimed land was visible. This once again, brought up the question the natural vs. un-natural/manmade. Is this real land?nIt was however, incredible to see how, Japan is bordered by the sea, but in a way not bounded by it. 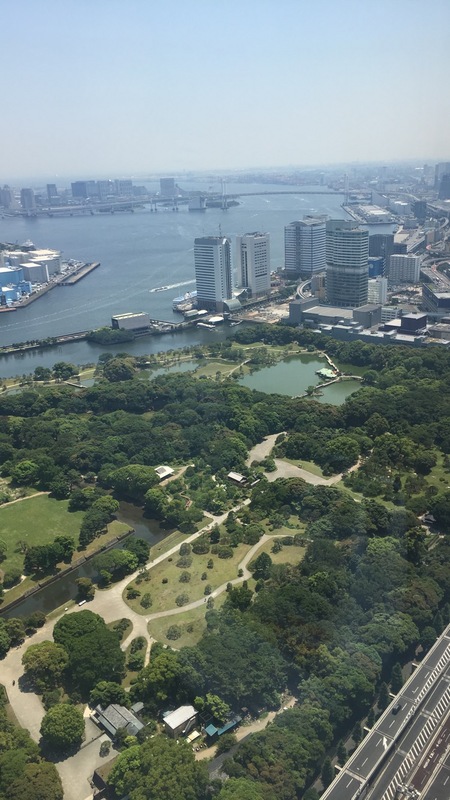 Tokyo is lined with massive skyscrapers and occasional oasis of nature such as gardens and parks. Meiji Period Museums, ideas, and artifacts are live in Ueno Park. 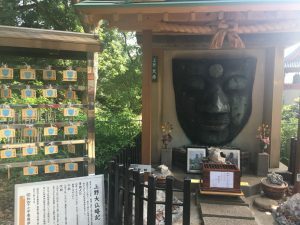 The Western art museum, the Meiji Museum, as well as the zoo (which we will be tending in the near future) and several Jinja and opera (shrine sand temples) are scattered through out Ueno Park. Otera (temple) where people wish for a good outcome on a test. Usually students wish to pass an exam/class or entrance exam. Tokyo is a dynamic place in which many aspects of life are woven into a surprise pattern, although the placement of these placement may seem out of place(issue of purity) such as a park placed in between skyscrapers or temples/shrines in the middle of a business zone- I think it is an attempt to live in this “concrete jungle” with occasional presence of the “other”(or the natural/not-manmade) in order to not forget about the forces of nature and our need for them. 日本語：Today was the first time where I was completely surrounded by the Japanese language. Although the day started pretty well-of interns of understanding and speaking-as the the day wore on communication grew harder (Hopefully due to the jet lag and not me forgetting structures and vocab…). The 日本語 adventure of the day was ordering dinner at the “food court” place underneath the department store. Our day started at the beautiful Waseda campus. After meeting Aridome-Sensei’s old friend and our tour guide Ozaki-San, who is a beautiful, energetic lady, we took the busy morning train to our first stop, Tsukiji Market. 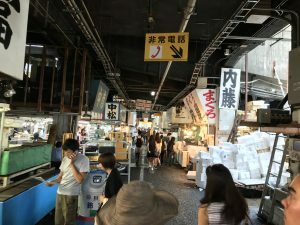 To my surprise, Tsukiji was still very busy even after the crazy auctions (which we were not able to go today), and it was incredibly engaging and rich in culture. 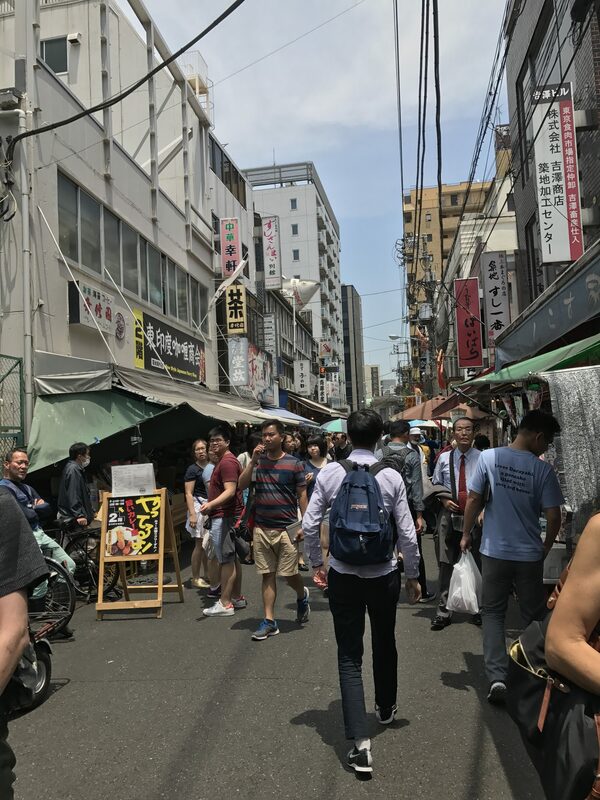 To my surprise, Tsukiji was still very busy even after the crazy auctions (which we were not able to go today), and it was incredibly engaging and rich in culture. 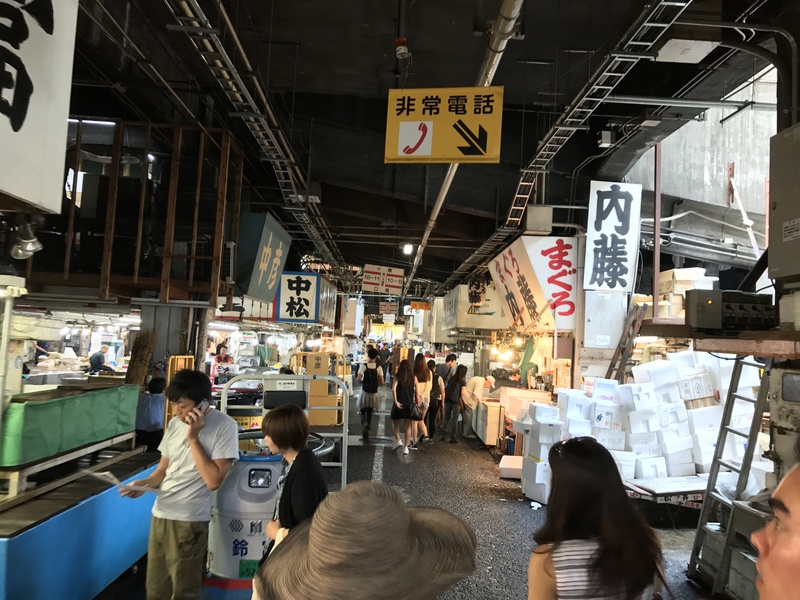 Observing the structure of the market reveals some interesting facts about Tsukiji. As it is distinctively divided into the intermediate wholesaler’s area and the outer normal market(I don’t know how to call it), the two parts target on different clients. The wholesaler’s area, as the name suggests, targets at the wholesalers and focuses on the early morning auctions. Whereas the normal market was flooded by tourists of all nationalities taking selfies while holding a giant piece of grilled squid or たまこ焼き. In the 通り outside of Tsukiji Market were a row of all kinds of small restaurants hosting all kinds of guests–middle school students, workers, サラリーマン in suits, and of course, some tourists. Although crowded and not neat, the diversity of the street created harmony in the smell of sea(food), car exhaust, and all kinds of foods. However, just as you think at Tsukiji you have all the choices in the world, you will soon realize the choices were already made for you. 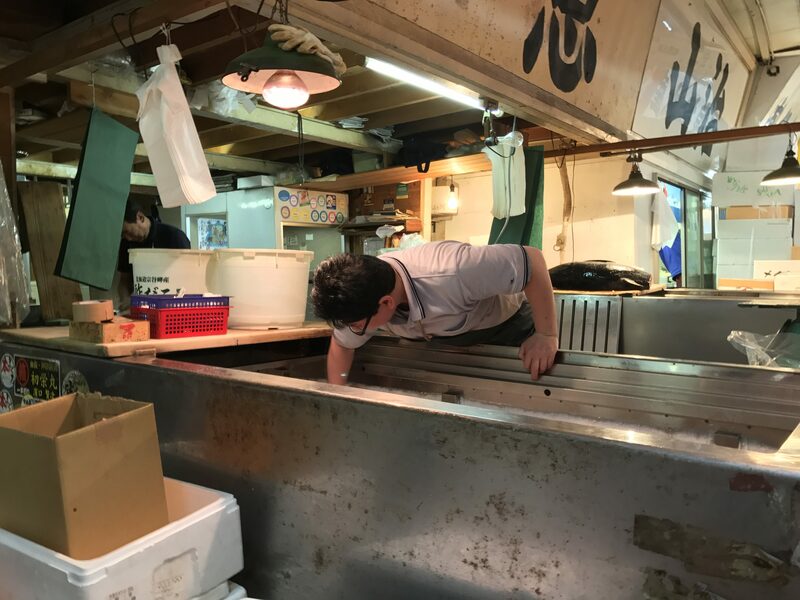 Although there are 200 tons of fish (I might be messed up with the number a little) sold every day at Tsukiji, the categories you can buy are limited. As we observed in the market, all the shops had almost identical 種類 for guests to pick, Tuna being the major fish. Lobsters and crabs and some other less common fish were less popular. All the shops had giant Tuna heads on the counters to scare off or impress clients and innocent tourists. Bringing up the different concepts of いちば and しじょう mentioned in the article “Wholesale Sushi Culture and Commodity in Tokyo’s Tsukiji Market”, Tsukiji is a place where the two concepts interact: the shijyō influences the economics of fish markets and determines the distribution of different kinds of seafood at the ichiba. The opposite of Tsukiji Market, which strives on the lowest level of Tokyo’s architectures, the skyscrapers are the defining features of the height of Tokyo. Looking down from 46th floor in Dentsu Tower (電通タワー), it amazed me how the incredibly diverse architectures of Tokyo talk to each other. While the whole city was crammed with buildings of all heights, there were still parks and greens to let it breathe, as well as the multi-level futuristic design of some buildings that brings out fantasies of the city. 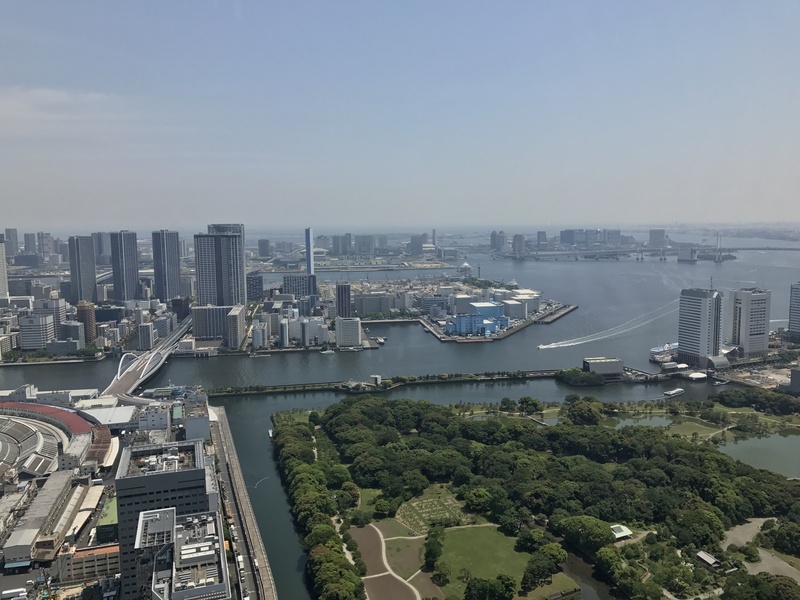 Although so densely organized that all land is utilized, Tokyo allows an organic mixture of modernity and nature, as evident not only in the 偉い view from the top floor of 東京都庁舎 but also in Ueno Park where people and nature, as well as religions, interact. Ueno Park was nothing more than a square of greens if looking from high up, but when actually wandering in the park, I found it a highly culturally engaging place. 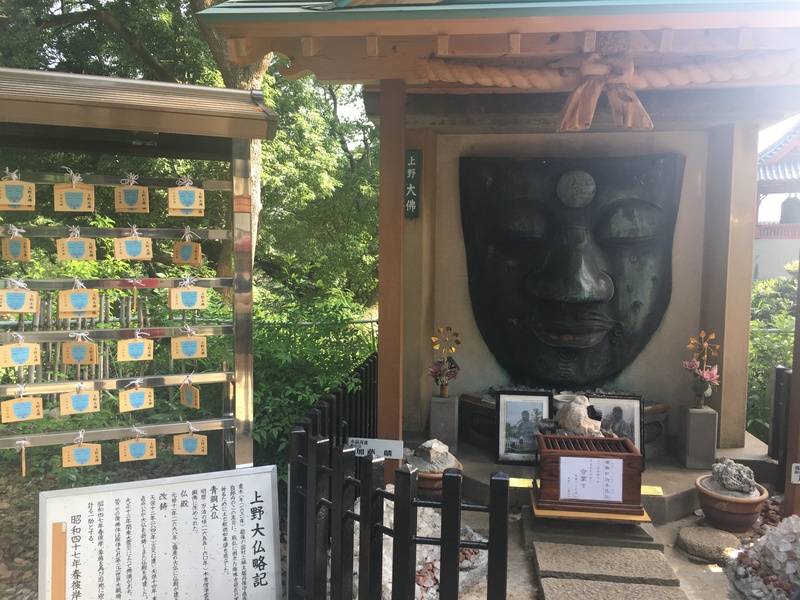 First, there is a temple and a shrine, allowing people to make wishes accordingly; in fact, the most fun part of our Ueno Kōen trip was reading all kinds of wishes and seeing other people’s 悩みや願望–perhaps we all have the desire to peek into other people’s private lives. Also, Ueno Kōen incorporates all kinds of people–small children, tourists, サラリーマン, and lovers. Surrounded by ambitiously tall “towers”, Ueno Kōen supports them like the roots deliver nutrients to their fruits. 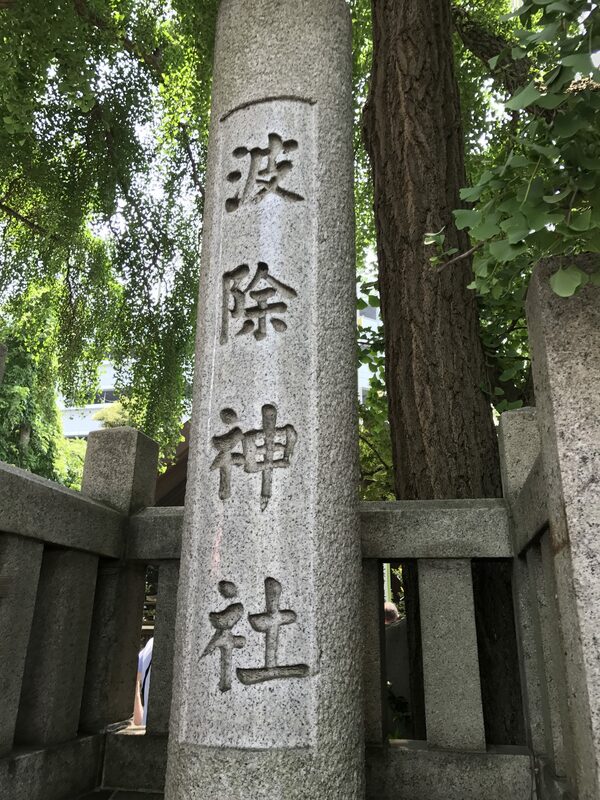 In this sense, the Shinto shrine and the Buddhism temple Ueno is providing a shelter for could be seen as the roots for the tall buildings of modernity. And we are in Tokyo!! I love it here 😀 Cities are always so exciting for me, and Bowdoin has deprived me of Asian food, so I was even more excited to just eat haha. First on our trip agenda was to meet Ozaki-san, our incredibly 元気 tour guide and long-time friend of Aridome 先生. She led us on a tour in Tokyo, with the first stop being at Tsukiji. Tourists love Tsukiji, but Tsukiji does not love tourists. 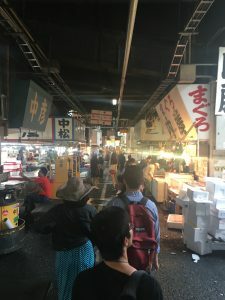 Unfortunately we did not get to experience the rush of Tsukiji–although this was probably better for safety reasons–but we did get to see what remained. It was interesting that the Tsukiji workers don’t like it when people take photos because it causes traffic jams. Something that stuck out to me while doing the reading and also while walking through the fishy aisles was the prominent idealized perception of what is fresh food. In Japan, there is so much attention to presentation and food being perfect and uniform. This isn’t to say that Americans or people of other cultures don’t value looks, but in my experience, American produce in the same display do not usually look the same (i.e. they are of varying quality). In contrast, all the food, down to the vegetables, in Tsukiji looked photo-ready. Again, the idea of purity appears!!! Nature has to be controlled, and it only has value when unblemished.